A 26year old male presented to the orthopaedics out-patients clinic with a 5months history of progressive pain and swelling in the left shoulder, without fever, night sweats, cough, weight loss, headache and altered sensorium with no meningeal signs. He had no medical history of diabetes, chronic renal disease, tuberculosis, alcoholism, leukaemia, lymphoma, AIDS, Hodgkin’s disease, corticosteroid intake or any organ transplantation. A preoperative blood count, liver and renal function, blood sugar levels, and tumor markers were all normal. Serological tests were negative for HIV and Hepatitis. X ray revealed multiple lytic lesion over the clavicle and proximal humerus with fracture. On MRI scan, multiple ring enhancing lesions depicting solid cryptococcoma were observed in the brain parenchyma. Biopsy from the bone and culture revealed cryptococcal infection. He was treated with surgical debridement combined with antifungal therapy for 8weeks. After 6months of follow up, the fracture healed well with no evidence of recurrence. Infection results from inhalation of aerosolized spores, which germinates in lung and disseminates to the central nervous system causing meningoencephalitis.4 Skeletal involvement is very uncommon and is documented in only about 5%-10% of patients with disseminated cryptococcosis.5,6 Most of the skeletal cryptococcosis are osteolytic in nature arises secondary to hematogenous spread from a primary infection. The radiological features of osseous cryptococcosis are non-specific and the findings simulates to those of osseous tuberculosis and other neoplastic lesions.7‒9 There have been very few cases reported of skeletal cryptococcosis and to our knowledge and extensive research the involvement of humerus and clavicle by the latter is not documented in literature. We are here presenting a unique case of cryptococcal meningitis in a young immunocompetent man who presented with pathologic fracture of the clavicle and proximal humerus. A 26year old Indian male presented to the orthopaedics out-patients clinic with a 5months history of progressive pain and swelling in the left shoulder, without fever, night sweats, cough, weight loss, headache and altered sensorium. Physical examination showed no meningeal signs. He had no medical history of diabetes, chronic renal disease, tuberculosis, alcoholism, leukaemia, lymphoma, AIDS, Hodgkin’s disease, corticosteroid intake or any organ transplantation. Laboratory workup showed mild increase in erythrocyte sedimentation rate of 28mm/hr with normal C reactive protein of 4mg/l. A preoperative blood count, liver and renal function, blood sugar levels, and tumor markers were all normal. Serological tests were negative for HIV and Hepatitis. X ray of the left upper arm showed multiple lytic lesion over the clavicle with the fracture of the surgical neck of humerus showing marked displacement (Figure 1). Surgical debridement was done and the material was sent for histopathology. Haematoxylin & Eosin stained section revealed numerous round to oval encapsulated yeast like organisms mostly in singles and occasionally as budding yeasts. Per-iodic acid schiff stain showed variable sized encapsulated yeast cells with prominent capsule (Figure 2). 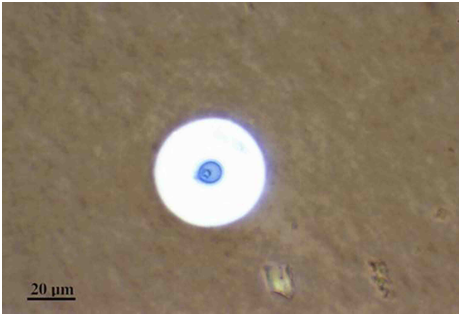 The Grocott’s methenamine silver (GMS) stained tissue section also showed typical encapsulated yeast cells morphologically consistent with Cryptococcus. 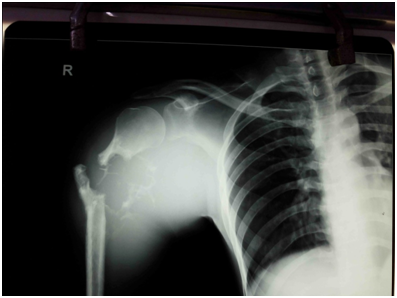 Figure 1 X- ray of the left upper arm showed multiple lytic lesion over the clavicle with the fracture of the surgical neck of humerus showing marked displacement. Figure 2 Tissue section stained by PAS stain shows variable sized numerous encapsulated yeast cells with prominent capsule. PAS stainx 40X. 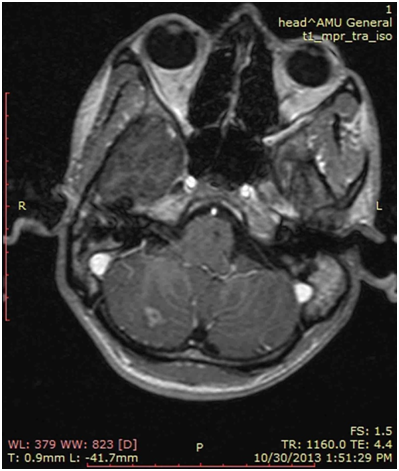 MRI scan was later performed with the suspicion of involvement of brain which highlighted multiple ring enhancing lesions depicting solid cryptococcoma in the brain parenchyma (Figure 3). 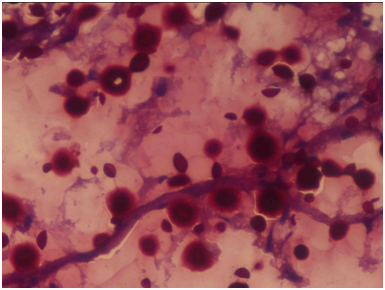 Microbiological culture on Sabouraud’s dextrose agar showed dark cream coloured smooth moist mucoid colonies positive for Cryptococcus (Figure 4). India ink staining also highlighted the budding yeast cells of C. neoformans surrounded by a characteristic wide gelatinous capsule (Figure 5). All the above investigations confirmed the diagnosis of cryptococcal meningitis. The patient was given intravenous amphotericin B (0.8mg/kg/day) and 5-fluorocytosine (1mg/kg/day) for 8weeks. After 6months of follow up, the fracture healed well with partial resolution of the lytic lesion and no signs of disease progression. Figure 3 MRI scans showed a typical ring enhancing lesion in the brain parenchyma. Figure 4 C. neoformans on Sabouraud's dextrose agar shows a typical dark cream coloured, smooth, moist, shining and mucoid colonies. 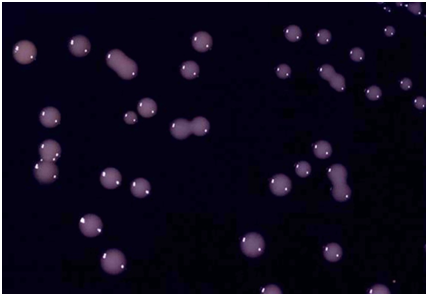 Figure 5 India ink preparation shows budding yeast cells of C. neoformans surrounded by a characteristic wide gelatinous capsule. The yeasts cell are usually spherical to oval, 5-7μm in diameter and typically refractory. Infection results from inhalation of aerosolized basidiospores. The most common clinical form of the disease is meningitis, which develops by way of hematogenous dissemination from the lung to the central nervous system (CNS).4,5 The onset of cryptococcal meningitis is insidious and simulates other forms of chronic meningitis such as tuberculosis. Dull occipital headache, fever, drowsiness, and alterations of consciousness or behaviour may be presenting features. Visual impairment may also develop. On examination, stiffness of the neck is often found and focal neurologic deficits may be elicited. Progression is slow in most cases, but the process is ultimately fatal if the patient is not treated. There are very few cases of osseous cryptococossis mentioned in the literature. The unique presentation as multiple fractures at a rare site and the immuno competence of the patient makes this case very unique and interesting. Chae HS, Park GN, Kim SH, et al. Rapid direct identification of Cryptococcus neoformans from pigeon droppings by nested PCR using CNLAC1 Gene. Poult Sci. 2012;91(8):1983‒1989. Barnett JA. A history of research on yeasts 14: medical yeasts part 2, Cryptococcus neoformans. Yeast. 2010;27(11):875‒904. Jou HJ, Lee FT, Wang MN, et al. Bifocal cryptococcal osteomyelitis: management of a patient with concurrent femur and rib infections. Hip Int. 2011;21:495‒497. Negroni R. Cryptococcosis. Clin Dermatol. 2012;30(6):599‒609. Agadi JB, Madni NA, Nanjappa V, et al. Cryptococcal osteomyelitis of the skull in a patient with transient lymphopenia. Neurol India 2010;58(2):300‒302. Jain K, Mruthyunjaya K, Ravishankar R. Cryptococcal abscess and osteomyelitis of the proximal phalanx of the hand. Indian J Pathol Microbiol. 2011;54(1):216‒218. Chan M, Lye D, Win MK, et al. Clinical and microbiological characteristics of cryptococcosis in Singapore: predominance of Cryptococcus neoformans compared with Cryptococcus gattii. Int J Infect Dis. 2014; 26:110‒115. Ramkillawan Y, Dawood H, Ferreira N. Isolate cryptococcal osteomyelitis in an immune‒competent patient host: a case report. Int J Infect. Dis. 2013;17(12):1229‒1231. Jain D, Najjar M, Azher Q. Cryptococcal sternal osteomyelitis in a healthy woman: a review of Cryptococcus neoformans. BMJ Case Rep. 2013;9:91‒92. Chen J, Varma A, Diaz MR, Litvintseva AP, et al. Cryptococcus neoformans strains and infection in apparently immunocompetent patients in China. Emerg Infect Dis. 2008;14(5):755‒762. Flannery MT, Rivera L, Casanas B. Cryptococcal neoformans osteomyelitis—a case report and review of literature. Med Case Rep. 2012;3:23‒25. Corral JE, Lima S, Quezada J, et al. Cryptococcal osteomyelitis of the skull. Med Mycol. 2011;49(6):667‒671. Feng X, Fu X, Ling B, et al. Development of a singleplex PCR assay for rapid identification and differentiation of Cryptococcus neoformans var. grubii, Cryptococcus neoformans var. neoformans Cryptococcus gattii, and hybrids. J Clin Microbiol. 2013;51:1920‒1923. Sehn J, Gilula L. Percutaneous needle biopsy in diagnosis and identification of causative organisms in cases of suspected vertebral osteomyelitis. Eur J Radiol. 2012;81:940‒946. Jacobson ME, Griesser MJ, Paloski MD, et al. Isolated Cryptococcus neoformans osteomyelitis of the proximal femur: a case report and review of literature. Orthop Surg. 2012;4:190‒193. Cook PP. Successful treatment of cryptococcal osteomyelitis and paraspinous abscess with fluconazole and flucytosine. South Med J. 2001;94(9):936‒938. Perfect JR, Dismukes WE, Dromer F, et al. Clinical practice guidelines for the management of cryptococcal disease: 2010 update by the Infectious Diseases Society of America. Clin Infect. 2010;50:291‒322. © 2018 Haiyat et al. This is an open access article distributed under the terms of the Creative Commons Attribution License , which permits unrestricted use, distribution, and build upon your work non-commercially.